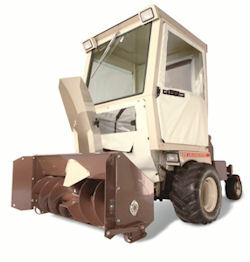 The DriftBuster features a 180° rotating discharge spout capable of throwing snow up to 30 ft. away. With the exclusive QuikConverter implement system, any Grasshopper FrontMount zero-turn mower can go from mowing to snow throwing in minutes without tools. An optional electric lift and electric spout rotation with steering lever-mounted joystick control are available.